Fred Dean was a rangy linebacker from Louisiana Tech (392 tackles) that was drafted in the second round of the 1975 NFL draft by the San Diego Chargers. He was converted to defensive end and set his sights on terrorizing quarterbacks in the AFC West. His best season for the Chargers occurred in 1978 when he recorded an unoffical 15.5 sacks. 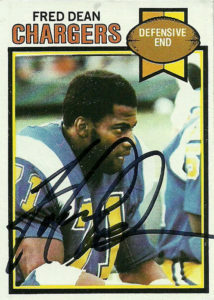 A core member of the ‘Bruise Brothers’, Fred played for the Chargers through the 1981 season, where he was traded during the season to the San Fransisco 49ers. 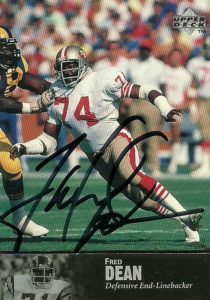 He served notice to the league by helping the 49ers win Superbowl XVI as the final cornerstone to San Fransisco’s defensive front. To top things off he also was named NFL Defensive Player of the Year. During 1983, Dean single-handedly humiliated the New Orleans Saints to the tune of 6 sacks, en route to a season high 17 sack season. He retired after the 1985 season and returned to his native Louisiana. The awards have slowly but steadily trickled in for Fred since then, with LA Tech honoring him in 1990, the Pro Football Hall of Fame honoring him in 2008, and finally the College Football Hall of Fame in 2019. A fearsome force, one must wonder if the accolades as a premiere defender would have come quicker to Dean if sacks were recognized earlier as a statistic in the annals of NFL history. He redefined the role of a pass rusher, helped modernize defenses, and be among the first situational pass rushers late in his career. Fred is also one of the rare players who has been recognized by two different teams as part of their anniversary teams. Such as the case it is hard to decide if Dean is represented better as a member of the Chargers or 49ers.